Lupus Erythematosus (LE) Cells are neutrophils that have engulfed lymphocyte nuclei coated with and denatured by antibody to nucleoprotein. The Lupus Erythematosus (LE) cell was so termed because of its exclusive presence in the bone marrow of 25 patients with confirmed or suspected SLE at the Mayo Clinic. The first three cases were children, the first a 9‐yr‐old with, very unusually, hypergammaglobulinaemia, plasmacytosis and Bence‐Jones proteinuria, the second, also 9‐yr‐old, with unexplained anaemia and purpura, and the third a boy with cryoglobulinaemia and purpura. A more conclusive link with SLE came after the LE cell phenomenon was observed in the marrow of a patient with classical SLE in 1948 by Hargraves et al. Lupus Erythematosus (LE) Cells are not usually found in peripheral blood, although Sundberg and Lick, also at the Mayo Clinic, observed in 1949 that the LE cell phenomenon could form in the buffy coat of peripheral blood after a period of incubation at room temperature while rotating with glass beads. Lupus Erythematosus (LE) Cells have since been found in synovial fluid, cerebrospinal fluid and pericardial and pleural effusions from patients with SLE. The LE cell reaction is positive in 50%-75% of individuals with acute disseminated systemic Lupus Erythematosus (SLE). Positive reactions are also seen in rheumatoid arthritis, chronic hepatitis, scleroderma, dermatomyositis, polyarteritis nodosa, acquired hemolytic anemia, and Hodgkin’s disease. It may also be positive in persons taking phenylbutazone and hydralazine. Negative findings on Lupus Erythematosus (LE) cell testing exclude a diagnosis of systemic lupus erythematosus (SLE). 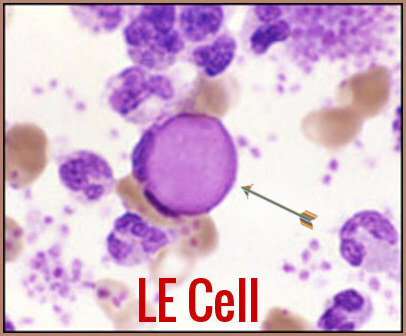 The discovery of the LE cell phenomenon remains a fundamental observation in the pathogenesis of SLE. Along with the VDRL test, the LE cell preparation remains in the American College of Rheumatology’s criteria for the classification of SLE. However, the test has been largely replaced by the antinuclear factor test (ANF) and DNA binding assays. An interesting article published in J Cytol. 2012 Jan-Mar; 29(1): 77–79, reported an unusual case of SLE in a 16-year-old female who presented with acute shortness of breath, fever and cough. Her chest radiograph showed bilateral pleural effusion. This effusion was tapped and sent to the cytopathology laboratory. The cytological examination of the pleural fluid revealed numerous LE cells and led to the diagnosis of SLE. Hargraves MM. Discovery of the LE cell and its morphology. Proc Staff Meet Mayo Clin1969;44:579–9. Sundberg RD, Lick NB. 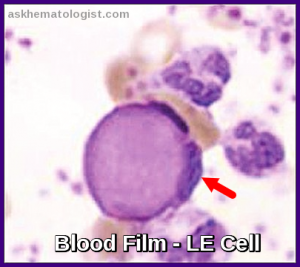 LE cells in the blood in acute disseminated lupus erythematosus. J Invest Dermatol1949; 12:83–4. Lachmann, P.J., A two-stage indirect L.E. cell test. Immunology, 1961. 4: p. 142-52. Ogryzlo, M.A., The L.E. (lupus erythematosus) cell reaction. Can Med Assoc J, 1956. 75(12): p. 980-93. Hepburn, A.L., The LE cell. Rheumatology, 2001. 40(7): p. 826-827. Tan EM, Cohen AS, Fries JF et al. The 1982 revised criteria for the classification of systemic lupus erythematosus. Arthritis Rheum1982;25:1271–7.